What are the steps to follow to get a Tev Tropin prescription? For the protection of everyone interested in getting a Tev Tropin prescription, there are certain steps to follow in order to get a doctor to write the perfect plan for this medication. The licensed physician should create a tailor made treatment plan for hormone replacement therapy (HRT) using the medication he or she feels would be best. Many doctors choose to write a Tev Tropin prescription for their patients. There are extremely important questions that one should ask him or herself to make sure that they are ready for HRT. This kind of therapy is not for everyone. You must be over 30 years old, have a growth hormone deficiency due to the process of aging and be ready to commit to a treatment plan and following a prescription for the medication that is prescribed for you. When you call Greenberg Health using our toll free phone number, the call and the consultation with one of our expert clinical advisors will be free. You and the counselor will discuss your unique situation. What are the reasons you feel HRT will benefit you? What are the symptoms that you are dealing with currently? What are your goals for therapy and what do you expect Tev Tropin will do for you? Are you willing to commit to the process of following a treatment plan that will be carefully created for you by one of our doctors? Are you willing to get testing done to determine if you have low growth hormone (GH) levels? Are you willing to be completely open and honest about your health situation and your medical history? Do you understand what is involved in the testing process? Do you know the benefits of Tev Tropin? Do you know the side effects of Tev Tropin? Do you know where to get Tev Tropin prescription? Are you willing to begin living a healthy lifestyle and changing bad habits into good ones? These are all things that are usually discussed during that first meeting between a patient and an advisor via telephone. It is important to make sure that you are ready to be a part of an HRT program because although it is very simple and easy to do, it is also important to commit to the process once you have started. For instance, you must take your injections exactly as prescribed and as often as prescribed. If you do not listen to the doctor’s orders and follow the Tev Tropin prescription and treatment plan that was written for you, you could be wasting your time or even putting yourself in danger. You must be willing to fully involve yourself in being committed to the process of preparing and delivering your injections correctly and in changing your poor lifestyle habits into healthy ones. This is the way that hormone replacement therapy will work best for you. We will be there every step of the way to help you with all your HRT needs. If you have questions or concerns, we will be just a phone call away. Our advisors are very understanding about the symptoms that occur when growth hormone levels deplete. They help patients to feel comfortable and encouraged during therapy. If you decide to continue your journey with HRT, you will need to get a blood test taken and get a physical exam completed. You will also be required to share your medical history. Your Greenberg Health advisor will set up an appointment for you with a clinic that is local to your home. You will attend the appointment and get your blood taken and get a medical exam done. You can fill out your medical history at home. All it requires is visiting our website where you can quickly find our medical history form. You are encouraged to be as honest as possible in filling out the information requested. Once you send it in to us, it will reach our clinic via a secure connection online. It is a simple form and will not take much time at all. This will be a waiting period for you. You have completed your responsibility of getting your testing done, your exam completed and you filled out your medical history form. Now you need to wait for our doctors to full analyze all the results. What are the doctors looking to find in your medical information? They need to see your growth hormone levels in your blood work. This will let them know if your GH is out of range on the low side. If it is, this will mean that you are dealing with a growth hormone deficiency. The doctor will look at the results of your physical exam to make sure that your health is good and that your ailments are most likely due to low GH levels. Lastly, they will examine your medical history to make sure that HRT will be safe for you. Our number one goal is the safety of all of our patients. Our doctors will make sure that clients qualify for HRT and to get a human growth hormone Tev Tropin prescription before they write one. 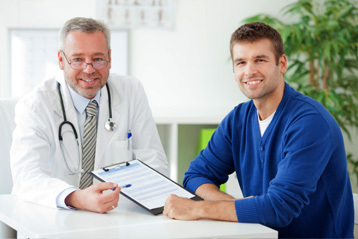 They will diagnose the patient with low GH levels and write that very accurate prescription. Once the doctor in charge believes that you are GH deficient due to aging, he or she can write your Tev Tropin prescription. The medications and everything you will need will be shipped to the address that you give to us. We ship quickly and discreetly. You are ready to begin HRT. Now you know about the Tev Tropin prescription how to get one and what is necessary to become a patient of hormone replacement therapy. At this point, you will be officially ready to embark upon a treatment journey that will change your life in the best possible way. Taking your injections and living a healthier lifestyle will give you everything that you need to live a great life that is full of quality. If you fully commit to the process and follow your prescription for Tev Tropin exactly as it is written, you should start to feel its benefits in no time. We are happy that you have decided to read through this page to fully learn about what is involved in the easy process of getting a safe and legal prescription for Tev Tropin.